Description: It is a large, woody, branched climber with milky latex. It has softly hairy, simple and opposite leaves. The plant bears clusters of small, yellow flowers. Fruits are slender follicles that contain winged seeds. How to Grow: In nature, it spreads over trees, scrub and hedges. In home herbal garden one plant in the ground near a tree or hedge is adequate to provide enough leaves for primary health care needs. It can also be raised in a pot of 25-30 cm size. Care regime: The plant requires humus-rich soil and partial shade for good growth. Watering two to three times a week is adequate. Collection: Leaves can be collected by plucking with hand and collection can be started from the plant after about three months of its planting. 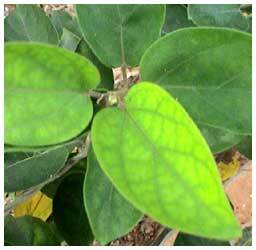 If maintained properly, this plant continues to yield leaves for many years.